So, I searched for related plugin, but didn't quite get the exact thing I want. Then decide to make one new on my own. This is my first try on wordpress plugin, so I want to share it here, hope folks found it usefull. 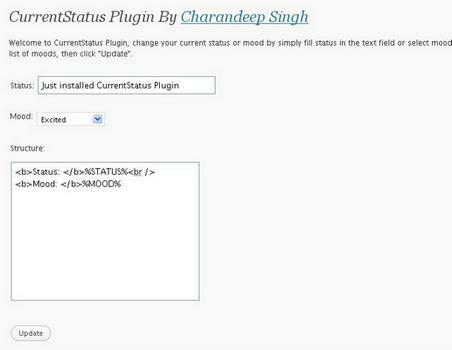 Firstly, Download the CurrentStatus plugin. 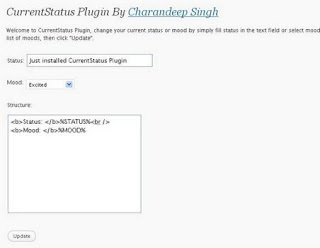 Unpack it and upload the directory currentstatus to your wordpress plugin directory (wp-contents/plugin/). Now you have to add a little code somewhere in your wordpress theme, where you would like to display your status. As I display on my sidebar, open sidebar.php for editing. Add the following code, where you want to display your status. That's all, We're done now. 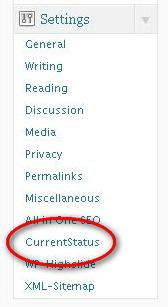 To change the Status and Mood, click on the CurrentStatus under Settings in your admin panel. You will see admin panel of the CurrentStatus Plugin.